It’s my turn, today, to join my fellow Crooked Cat authors in providing an item for our more-than-a-month-long extravaganza of FREE short stories, non- fiction articles and poems. This “Christmas with Crooked Cat” contribution contains experiences in the Holy Land which left me with mixed feelings. Not wanting to be overwhelmed by religion, I went with a secular group. 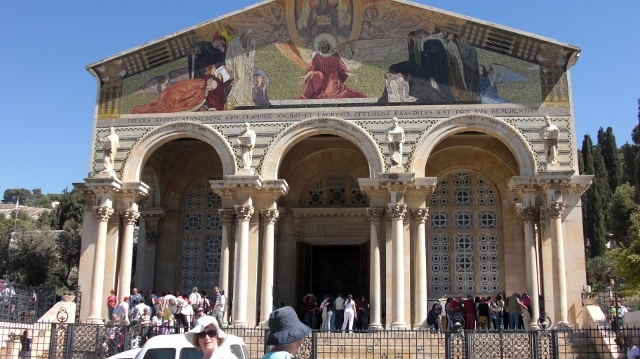 We emerge from our hotel on the far side of the Kidron Valley; our first stop is the Garden of Gethsemane, and I detach myself from the group to sit in the Church, listening to familiar hymns while English pilgrims hold a service. I join in, but am called by the others before the service ends. We walk across the valley and up towards St. Stephen’s Gate (The Lion Gate), which leads to the Muslim quarter. There is a pile of stones on the right. I think of Paul, guarding the clothes of those who had stoned Stephen, the first Christian martyr. The road to Damascus, where Paul was converted, isn’t on our itinerary. The following day we go to Bethlehem on the West Bank, passing smoothly through the checkpoints and the wall, with its graffiti. It is much quieter than the Israeli side; shops are boarded up and the streets are deserted. We pass some grand houses and many tourist buses, for the Israelis and the Palestinians are at “peace” now. Our guide jokes that in peace time, life is hectic and tense because of all the tourists; when they are at war, the people live a quieter life. The Church of the Nativity is full of scaffolding. There are areas for the different religious sects, each with their own style of chapel. People quietly go about their private prayers, walking round, or just sitting and looking. We cannot get near the alleged spot where Christ was born, nor do I glimpse it through the “keyhole” in a wooden door from the other side (somebody is blocking my view). But away from this main attraction, it is a restful, holy place. Back in Jerusalem, the Museum displays a model of the ancient city in the blazing sun near the entrance. I spend an hour under the white (good) “Shrine of the Book” dome learning about the Qumran Scrolls, and on a lower level, the Dead Sea Scrolls. Time whizzes by. 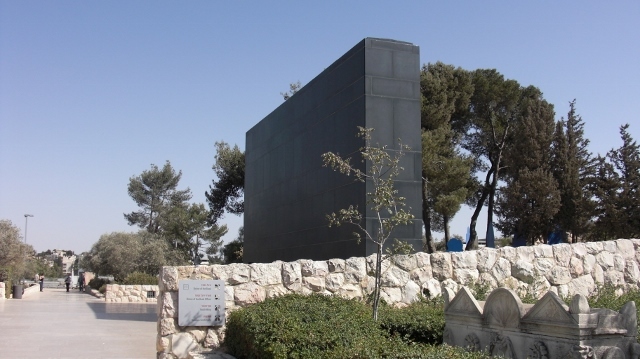 A black (evil) wall stands in stark opposition to the dome. “In the Jewish quarter, away from the madding crowd, austere black-clad figures, their tight curls showing below top hats, glided down the stone pathway. A graphic mural depicted Jerusalem past and present, the atmosphere was hushed and reverent. (Ann) stepped into the sunshine and descended towards the western wall. A sabra in dull green and brown camouflage lounged against the wall, self-contained and aloof. Their eyes met and Ann recoiled at the animosity of the gaze. The face was young and fresh, how could it harbour such hatred? Ann tweaked at the flowing veil draped over her head and shoulders against the sun. Her blouse had long sleeves, she wasn’t indecent, surely? Other ladies in her group were showing more flesh. A mass of black figures in top hats converged on the Wailing Wall far below. Some earnest young Jews accosted her and she responded, politely accepting their blessing in the form of muttered prayers. She glanced at their faces. They must still be teenagers. Their voices were friendly, almost pleading. She didn’t understand what they were saying. One of them gently took her hand and produced a thin scarlet thread. With polite enquiry he mimed tying it round her wrist. Was this some sort of ritual? Ann shrugged. They seemed friendly enough, so she offered her wrist. Two more came close. Did they want money? She had to catch up with her group. Ann fumbled at her bum bag, and they crowded round her like greedy ravens, chattering urgently in their strange language. She only had a few coins left, and didn’t feel like giving them a note. Her steps quickened. They trotted after her, raising their voices. What was this ritual? Did they think because she had the thread round her wrist, she owed them something? An elderly woman squatted above the pathway surrounded by baskets. She called out at the three youths, castigating them roundly, and they fell back. Sighing with relief, Ann paused in gratitude; the woman waited expectantly. Ann had no desire to go near those youths again. She fumbled in her purse and drew out a handful of coins, placing them in the woman’s palm. There was a gasp of disappointment. Ann sensed the youths starting back towards her. She fled down the hill. The scarlet thread was still fastened round her wrist. She tore at it as she ran, trying to get it off. It was strong and wouldn’t break. She couldn’t get it over her hand. This entry was posted in I Lift Up My Eyes, Travels and tagged Bethlehem, Christian, Church of the Nativity, Damascus, Gethsemane, Holy Land, Israelis, Jerusalem, Jewish, Kidron Valley, Muslim, Palestinians, The Lion Gate, West Bank. Bookmark the permalink. Thank you for that, Margaret – and for the link – much more informative than Wikipedia! If you read on in my book, you’ll find out what happens (or does not happen) to Ann’s “luck”!